Nederburg is excited to be showing some of its traditions and innovations in Paarl on 8 September, as it marks the 44th year of the Nederburg Auction. The annual event, considered the Capes pre-eminent showcase for the country top fine wine producers, is a major highlight on the South African wine calendar. Over the years, it has evolved a reputation as one of the foremost wine auctions in the world and is considered the oldest in the New World of wine. Bidder attendance is by invitation only, while the wines on auction are required to meet a stringent range of criteria as to quality, age and availability. Highlighting the remarkable longevity of Nederburg wines and the equally appealing collectability of its newer vintages, this years line-up from the award-winning Paarl cellar totals 16 iconic wines, expertly selected by a panel of wine specialists including local Master of Wine (MW) Cathy van Zyl, British MW Tim Atkin, Richard Kershaw MW, Greg Sherwood MW, Michael Fridjhon, Roland Peens, William Wouters, and Francois Rautenbach, joined by associate judge Wikus Human, who is the current title holder for Best Young Sommelier in South Africa. The wine selection process was overseen by coordinator Higgo Jacobs, the chair of the South African Sommeliers Association (SASA). The oldest Nederburg wine to feature on the 2018 Nederburg Auction is a 1964 Port made by Günter Brözel, Nederburg cellar-master for 33 years (from 1956 to 1989). His only Port, made exclusively from Shiraz grapes, still exhibits rich, ripe and silky fruit and notes of spice, vanilla, raisin and caramel. Each bottle is individually numbered and sealed with a coat of wax. Brözels mark continues in a very elegant and vivacious 1975 vintage Cabernet Sauvignon. Its brilliance of colour is still very much in evidence with a dark red centre widening to an orange tint, says current Nederburg cellar-master, Andrea Freeborough. Other Cabernet Sauvignons on offer are the Private Bin R163 of the 2003 and 2009 vintages, and the Two Centuries Cabernet Sauvignon form the 2007 vintage. All of these, featuring complex and layered dark fruit flavours, were made by Razvan Macici from top-quality fruit sourced from vineyards that grow on the slopes of the Simonsberg in the Simondium (Paarl) region. Macici was Nederburgs cellar-master from 2001 until 2015. The legacy of Brözel is also represented in a two Edelkeurs, the 1996 vintage hand-made by Newald Marais, and 2012 vintage by Macici. The renowned Edelkeur noble late harvest made from botrytised Chenin blanc, South Africas first, has earned Nederburg considerable international kudos over the years. It gave rise to the Nederburg Auction in 1975 and later went on to help earn its cellar-master, Günter Br?zel, the Robert Mondavi Winemaker of the Year award at the International Wine & Spirit Competition (IWSC) in 1985. The multiple-award-winning Edelkeur remains the benchmark against which South Africas botrytised wines are measured. Nederburgs other high-profile sweet wine, Eminence, made from Muscat de Frontignan, is represented with two vintages: the 1998 and 2012. The latter is extensively awarded, boasting trophies, gold medals and five-star ratings earned internationally and locally. Also included in the auction line-up are the 2004 and 2011 vintages of Nederburg Private Bin R121 Shiraz, showing seductive notes of pepper, spice and leather, and succulent berry flavours with ripe, soft tannins and well-integrated oak. The Private Bin R181 Merlot 2009, made from grapes that came from Darling vines and matured in small French oak for 18 months, offers scents of violets and sweet spice followed by fragrances of ripe berry and a hint of mocha and vanilla. Its rich and full with layers of fruit, oak and spice, and tannins that are soft, yet firm. Nederburg Ingenuity Italian Red 2008 offers an exciting taste discovery, featuring an innovative blend of Sangiovese (50%) from dryland vineyards in Darling, Barbera (45%) from the cool-climate area of Durbanville, and Nebbiolo (5%) from the high slopes of Simondium. 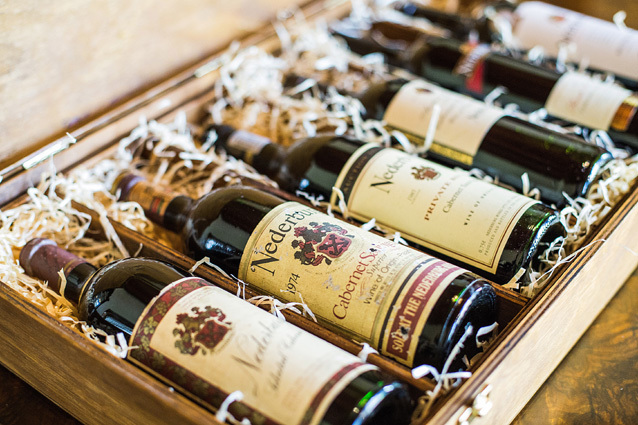 Three wines from Nederburgs gourmet Heritage Heroes collection are also poised to go under the hammer of auctioneer David Elswood, the highly acclaimed international head of wine for Christies, this September. It includes the debut 2009 vintage of The Motorcycle Marvel Rhône-style red blend, named to honour Brözel who was known for his exceptionally high standards. Getting around the Nederburg farm on a BSA 250cc motorcycle, he checked on everyone and everything to ensure his exacting demands were met. The second wine of this series to be auctioned is the 2013 vintage of The Anchorman, a wooded Chenin blanc, a portion of which was made using the carbonic maceration method. It commemorates Nederburgs founder, Philippus Wolvaart, who bought the farm in 1791 and planted Chenin blanc, amongst other varietals. And finally, theres The Young Airhawk, barrel-fermented Sauvignon blanc of the 2015 vintage, that pays tribute to Arnold Graue, the young adventurous winemaker at Nederburg who introduced many technical innovations and won many awards in the late 1940s and early 1950s. He was also a keen young pilot, who loved to explore the open skies of Southern Africa. He died tragically at 29 in a light aircraft crash. A pre-tasting of all wines to be offered for sale on auction takes place at Nederburg on Friday, 7 September, to be followed by the Nederburg Charity Auction which will see three lots sponsored by Nederburg being knocked down by auctioneer Roland Peens. One lot includes a venerable line-up of wines spanning an incredible six decades, including Nederburg Cabernet Sauvignons from the 1966, 1974, 1985, 1991, 2003 and 2013 vintages, signed by Brözel. A second lot is meant as a tribute to Nelson Mandela, featuring a carefully cellared collection of 12 x 375ml bottles of two of Nederburgs iconic dessert wines: 6 x Edelkeur 1991 and 6 x Eminence 1994, as well as a private tour of Robben Island, off the Cape Town coast, for eight guests, and a gourmet lunch in the V&A Waterfront featuring some award-winning Nederburg wines. The third lot is an unforgettable Cape Winelands wine and whisky long-weekend experience for six guests including three nights accommodation in the breathtaking Plaisir de Merle manor house, special wine and whisky tastings as well as lunches and dinners at a variety of venues, and a ride in a motorcycle side-car en-route to Nederburg for a gourmet lunch. This lot is sponsored by Nederburg as well as Plaisir de Merle, Bains Cape Mountain Whisky and the Distell Tabernacle. Visit www.nederburgauction.co.za for more information on the auction. Go to www.nederburg.co.za for more details on the brand. It was to work within prevailing legislation that the Nederburg Auction was established in 1975. At the time, the residual sugar content of natural wines could not exceed 30g/l, whereas Nederburgs Edelkeur came in at well over 200g/l. A compromise was reached with the authorities of the day whereby the maiden 1969 Edelkeur, that had already captured significant international attention and acclaim, could be sold on auction to local licensed wine buyers. The organisers decided to use the opportunity to showcase a handpicked collection of other rare and very special wines too. The law subsequently changed but the auction remains a key source of rare and limited-edition connoisseur South African wines, and Edelkeur remains a significant draw card for bidders, fetching impressive prices with its alluring and luscious honey notes backed by vibrant acidity.